The Tambourettes The Tambourettes like you have never seen them before. SL RockFest 2010 Mozy Pera shot this at 30fps, great editing job. Grif XMAS 2010 Another great video from Mozy. Great work! Poseball Blues Collection of gig shots - see if your date night ever went like this one! Dive Inn Shot by Geo Meek - Where else can you perform with a horse and a mermaid in the same audience? Love is Strong Raw Song by the Stones! The Crosshairs Get your Tambourines Out. Do You Love Me? Rusty playing tambourine like it’s never been played before. All three of us singing. Great version – Check it out! Black Horse / Cherry Tree Go Porter! Use Me You know you want to! Tonight Live TV Interview with Paisley Beebe onTreet.tv, includes performance of Crosshairs, and shots of the Tambourettes in the studio. The Sixty-One On the Sixty-One, artists make music and listeners decide what’s good. SoundClick Another Music site—you can get a widget to play my music and add it to your own site if you like. 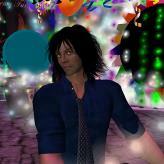 IndieSpectrum Radio All Second Life Artists, all the time, no commercials. This link is for the web site so you can request artist music. IndieSpectrum Stream Click the Link, Hear the music. I can’t say I keep these terribly up to date, but I do check for messages and visit.